The Oxygenics® Elite FC Showerhead is a single spray pattern fixed showerhead in CHROME. The unique powerful spray offers a dynamic and luxurious shower experience. The patented design of the Oxygenics Core™ has been at the centre of Oxygenics design for over 20 years. The Spray pattern produces a powerful jet like spray which will leave you invigorated. 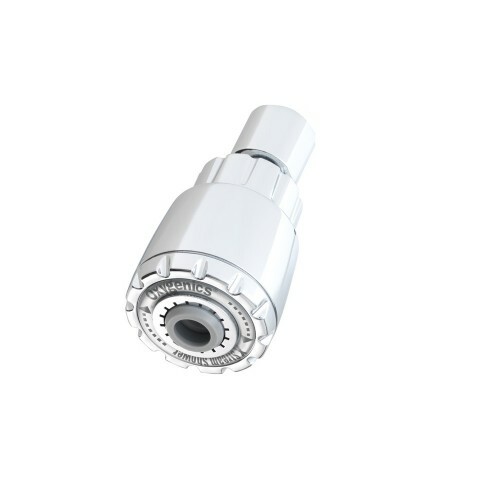 The Elite FC has a built in Flow Control valve on the side of the showerhead. This can easily be rotated to reduce the flow from full power, to a lower flow or even down to a trickle. This is very useful when soaping up in the shower and removes the need to turn the shower off and on again. The Spray pattern produces a powerful jet like spray which will leave you invigorated. Oxygenics Elite FC Showerhead requires 1.5 BAR of pressure to operate. Not for use on gravity fed systems. This showerhead attaches to a fixed shower arm (not a shower hose).